As the maid of honor, you have the fun and exciting duty of planning the bachelorette party — one last party for your friend before one of the most important days of her life. Being a maid of honor is a big responsibility. You have a lot of duties and expectations. You may even be given the task of helping the bride plan the wedding. While that is intimidating, one thing you can do that will be the best decision you could make is having the bride tour Bohemia River Overlook. Our wedding venue includes three different locations on our beautiful property, helping your friend find the perfect location and style for her wedding. Tour the manor, the beach, and the barn to find the perfect location for the wedding. This one suggestion can make your friend’s wedding planning simpler and help create the backdrop for a beautiful wedding. Now that you have helped find the perfect venue, it is time for you to start planning the ultimate bachelorette party. This single celebration has the ability to be the best night ever or a hot mess of a night! But we will help by giving you tips on how to get started plan the perfect bachelorette party that your friend will love! Read on to learn more. Unless this friend has been your best friend for 15 years and you know every detail about their dream wedding, bachelorette party, and honeymoon, you will want to talk with your friend before planning. Not every girl loves the Las Vegas party, not every girl wants to have so much fun that they do not remember the night, and not every girl needs a huge and wild party. Talking with your friend and figuring out what kind of party they want will help you plan the party based on what they are hoping for and expecting. Maybe they are the type who wants to sit in a cozy cabin, drinking Irish coffees, and playing card games. Everyone is different and your friend may surprise you with the kind of party they want, don’t assume they want a wild party. Some of the best bachelorette parties turn into weekend trips with the bride and her closest friends. It doesn’t have to be one night that ends suddenly. Plan a weekend getaway that matches the type of party the bride wants. Take Friday off so you have a long weekend with your girls and enjoy the time together, have a spa day, relax, and have fun. Depending on what you are doing during the bachelorette party, you will want to make sure all the plans are set. Make reservations to restaurants, spas, shows, and anywhere else you may need a reservation, like the hotel! You don’t want to show up somewhere to find out they are too busy to seat you or take care of your party. This will ruin the party and maybe even the entire weekend. 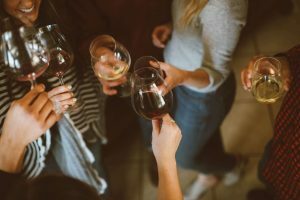 These are just a few quick tips for getting started planning the bachelorette party, but they may be some of the most important. Don’t make assumptions about the type of party, find somewhere fun to go, and make reservations! And don’t forget to schedule a tour at Bohemia River Overlook! Contact us today to get started.